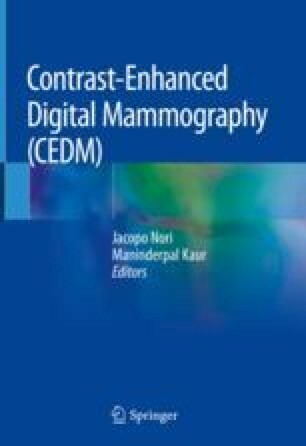 Different patterns of contrast uptake and the morphology descriptors of enhancing lesions observed by CEDM are still under study; however, based on our experience and data published in the international literature, the use of a well-defined and standardized lexicon similar to the MRI BI-RADS lexicon instituted by the American College of Radiology (ACR) is recommended to characterize breast lesions by CEDM. As in MRI, CEDM classifies the lesions seen in subtracted images into three main groups: focus, mass and non-mass enhancement. In this chapter, we will demonstrate how we apply the MRI BI-RADS lexicon to CEDM and discuss the main differences between the two methods.